I didn’t think I was going to do a picture post this week because I couldn’t remember taking very many pictures. After checking my phone I found I took a few worthy shots this week, so here you go! I returned a few pallets to our Pioneer dealer, and while there I ordered 16 additional bags of waxy corn. Tate & Lyle has upped the premium for waxy in 2013 so we are going to grow more waxy corn next season. A radish growing in our wheat. I wanted to try a little experiment this fall after reading about some farmers trying this out. 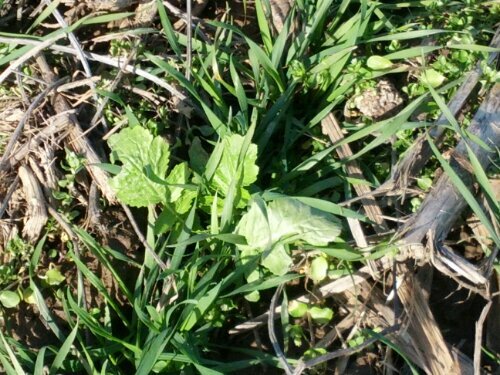 If you’ve been following along you’ll know that we have some radishes and oats growing as cover crops to scavenge nutrients over the winter. The idea with the wheat is that as it begins to grow again in the spring it will benefit from the release of nutrients provided by the decomposition of the radishes. We’ll know the results in about seven months. You have to have patience when trying out new things on the farm because your results often won’t come for quite some time. The shop was hosed down this week in preparation for our big extended family Christmas party on Sunday. 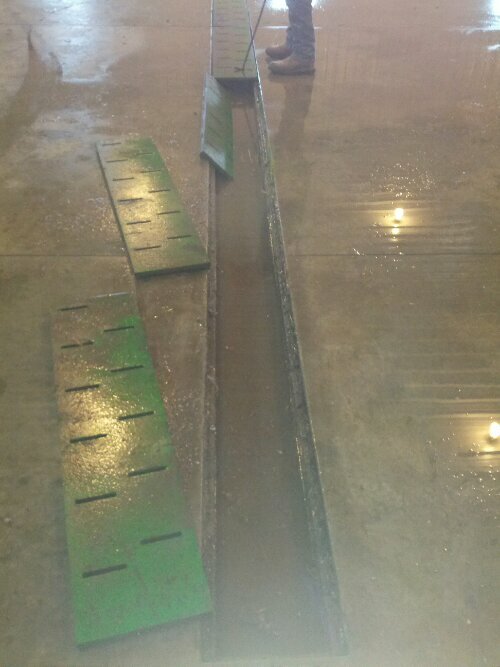 Here we are taking the cover off the drain and cleaning the accumulated dirt out of the bottom. 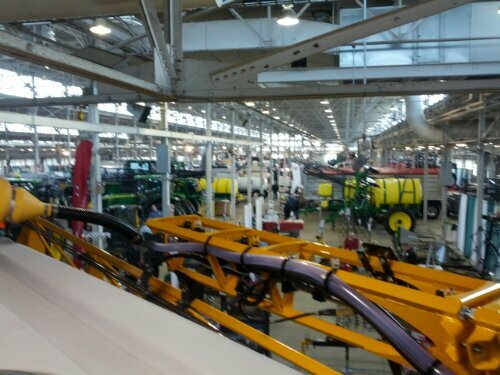 I took this shot from the top of a Hagie sprayer at the Indiana-Illinois Farm Show in Indianapolis this week. 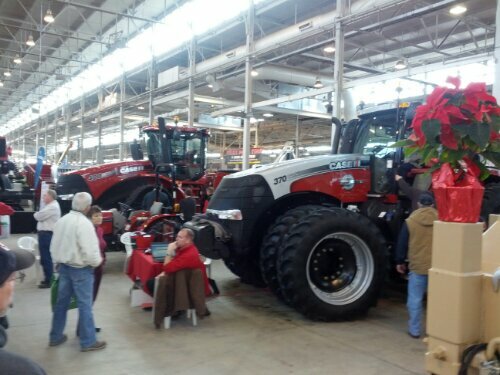 I sat in both of these Case tractors at the show. The tractor in the background is their new 4WD row crop track tractor. I liked the layout of the controls inside the cab of both tractors. Don’t tell anyone I said that. I don’t cut down many trees, but this is awesome anyway. 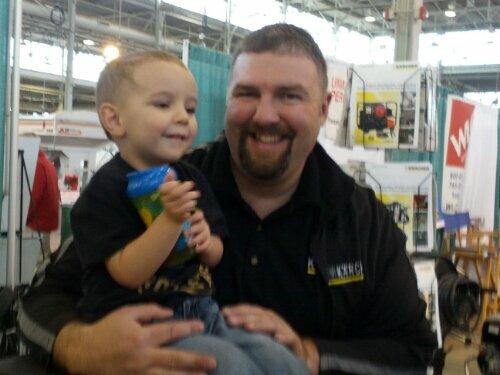 My son meeting up with his Uncle Jamie at the farm show! Jamie sells Karcher products at a local dealer and runs a booth at the show each year. He travels all over delivering pressure washers. Maybe you’ve seen him? We have two tanks for diesel fuel on the farm. 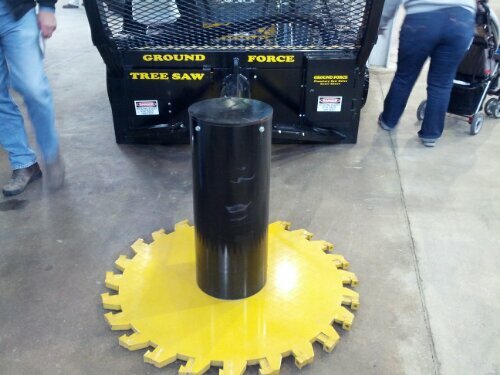 One is for tractors, and the other is for trucks. The main difference is we pay taxes on the truck fuel just like you would filling up in town. The tractor fuel doesn’t have those taxes. 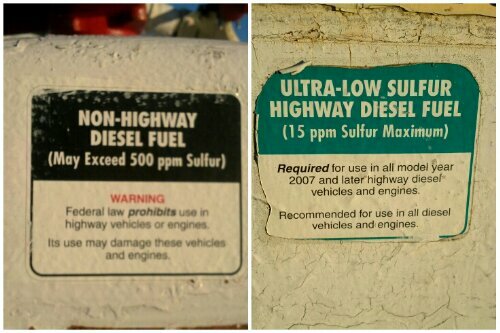 I think the fuel may all be low sulfur but they color one red and the other green. 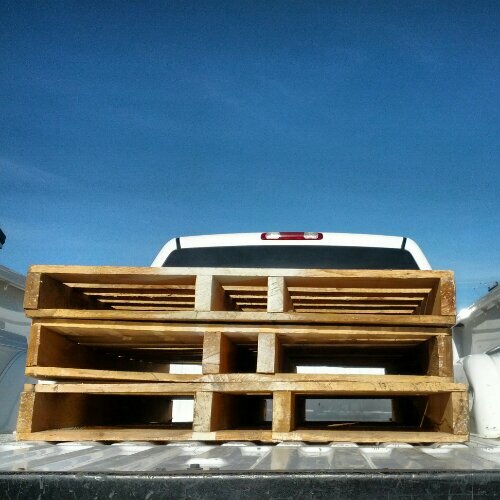 In case you are wondering, yes, we do fill the proper equipment with the proper fuel. We don’t put the cheaper fuel in the trucks. Soil test data from one field right here at the home farm. I think I’ll take you deeper into this in another post later on. Thanks for looking! What did you do this week? This entry was posted in Pictures and tagged corn, equipment, family farm, indiana, Pictures, seed, tractor, wheat. Bookmark the permalink. Brian, I just love your blog. Thank you for sharing your interesting life. We are in the midst of home cleanup, repair and minor remodeling. Our deck rotted in places, so we had those boards replaced. We’re waiting for dry weather to pressure wash, sand and seal the deck. As for my southern California organic vegetable garden and fruit trees, visit my blog to see. Thanks! I have a brand new deck that is functional, but I still need to get motivated the put in the permanent stairs and finish the handrail. Ha. I don’t think they’re too worried about it. The soil test photos look interesting. It would be interesting to have a look through them. When you get the soil test data, does it always come back in a book form? The results we get always come like that. 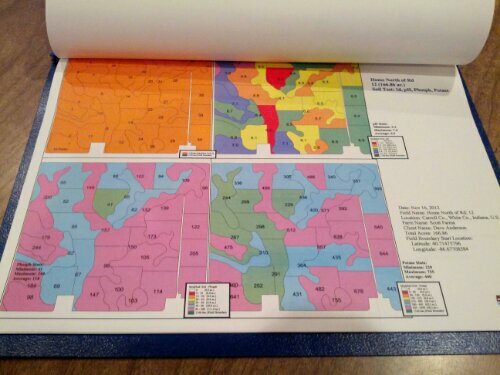 First are the ph and fertility levels followed by maps of what type and how much of each input would be applied to a particular zone. The rest is spreadsheets breaking down those figures further.